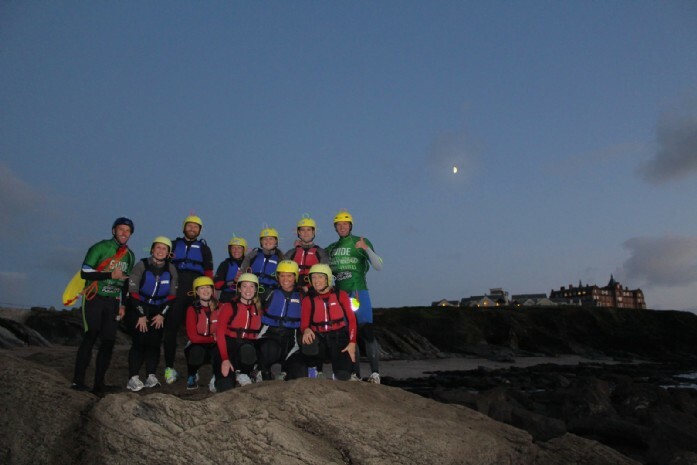 One of the perks of living in this part of the world is the opportunity for excitement and new experiences, so when we were invited to go night coasteering with the team at Newquay Activity Centre we grabbed our wetsuits, glowstick adorned helmets, and set off into the moonlit waters like a bunch of thrill-seeking fireflies! 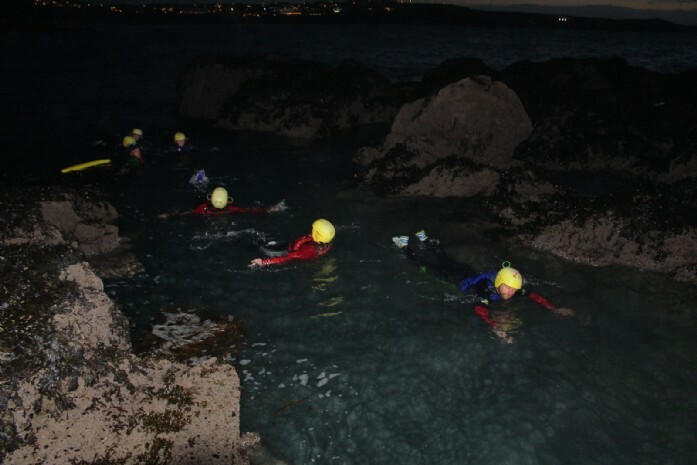 Our first challenge was a climb across an overhanging ledge, with footholds set in underneath, which while seemingly innocent did send a few of the party splashing back into the sea. After getting everyone along and over this, with one or two cheeky participants taking the easy way up, it was along ‘the devils finger’ and back into the water for another swim. The push and pull of the waves and our own strength ushered us along a watery corridor, a proud full moon lighting the path for us towards our next obstacle. Here we once again climbed up and out of the water, Brendo from the activity centre offering a helping hand where necessary to make sure we all got up and going towards the pinnacle of the trip; the plunge pool. By this point, the sun was well and truly in bed, and we headed towards the plunge pool with the light of the moon, our glowsticks, and the occasional flash of a waterproof torch. What awaited us was both serene and exciting; a wind-sheltered pool surrounded by smooth rock faces offering jumping points to those looking for a quick burst of adrenaline. The brave among us hauled ourselves eagerly out of the water and scampered up towards these ledges, with the more reserved following cautiously behind. Up here the marshals would repeat the lesson given to us before departure; ‘arms out on take-off and then feet together and crossed arms for the landing!’, and the first person stepped up to the ledge. 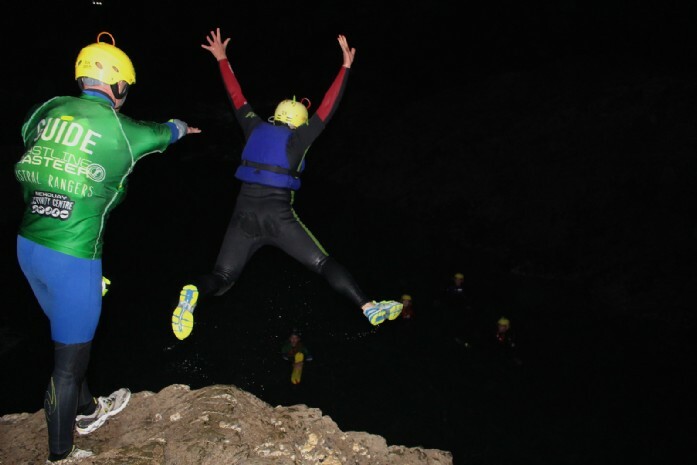 With Johnny from the activity centre’s hand on the back of the life jacket to avoid a premature departure, and Brendo waiting down in the water, the first jumper steeled themselves as the group counted down, and on the cry of ‘go!’ launched themselves into the abyss. A great splash and a thumbs up later it was time for the next jumper. After everyone had cast themselves off the rocks and into the sea, some of us more times than others, we took a moment to float on our backs and appreciate the clear night sky above where the stars had come out to join the full moon. 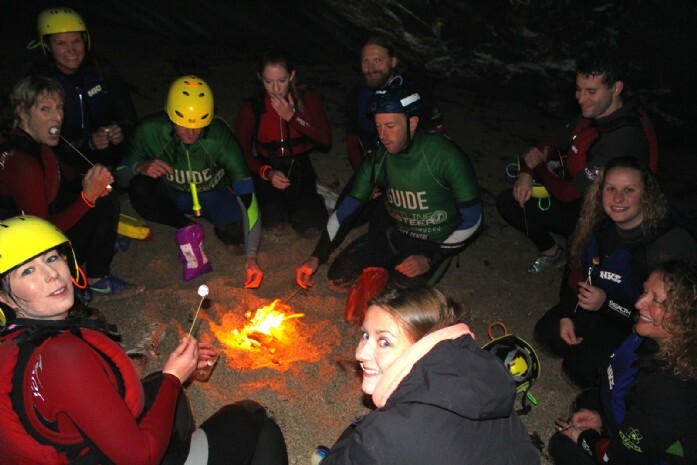 After we climbed up the rocks and walked back along the coast path to the beach where Brendo showed off his bushcraft skills and whipped up a small fire for toasting marshmallows to go with a well-earned hot chocolate. We eventually made our way back to the activity centre to rinse off under the hot shower and go our separate ways. 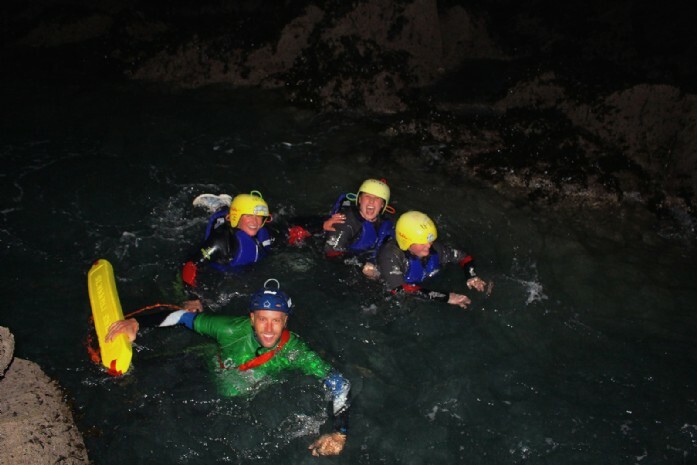 Newquay Activity Centre gave us a truly unique coasteering experience as even those of us who have lived in Cornwall our entire lives have seldom ventured into the water in the dark, and it was fantastic to be able to do this with the confidence that you were with an experienced team on a pre-planned route and could just focus on enjoying the water. 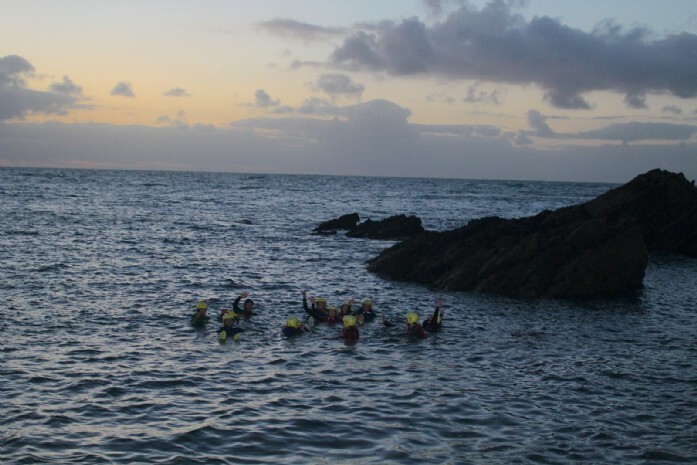 If you find yourself within striking distance of Newquay you must allocate a day to spend with Newquay Activity Centre, if coasteering isn’t your flavour of choice then why not try surfing, bodyboarding, or even giving their giant stand up paddleboard a try! The sea’s the limit!